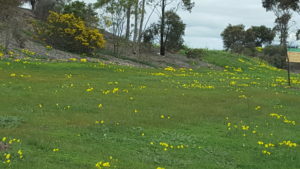 Yellow flowers have sprung up in recent weeks along the Western Highway and Deer Park Bypass. This afternoon, I noticed at least three different varieties: small wattle bushes, clumps of bright yellow flowers standing out against the grasses and tiny flowers on long stems waving in the breeze. 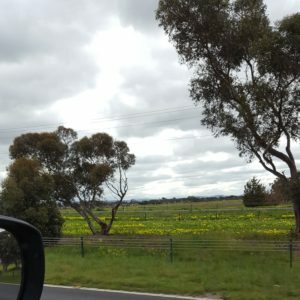 I suppose the wattle bushes have been planted, but the other two have simply sprung up along the roadside and in the median strips, unbidden and largely unremarked. When the sun is out, they shine and nod at the passing traffic. More than that, they serve as a kind of resistance to the landscape with its concrete and every-spreading development. 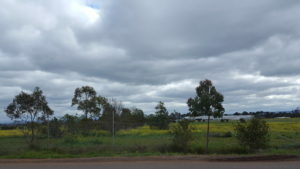 For instance, they are prolific along the fence that borders the new Ravenhall Prison site currently under construction. They were here before us and will continue long after we have gone, these humble flowers; not a ‘host of golden daffodils’, but all the same, ‘fluttering and dancing in the breeze’.